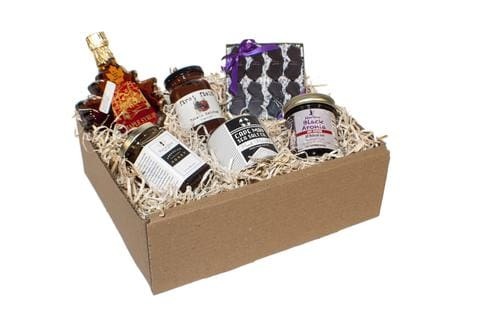 Our custom local goods gift boxes provide a unique approach to corporate gift giving and will make a lasting impression on clients, prospects or employees. They also make a perfect gift to thank your wedding party or special event guests. You can choose from one of our themed boxes or create a custom box by choosing from our curated collection of local, artisanal products. We can work with you to incorporate your company’s logo or personal messaging on labels and gift tags. We can accommodate dietary preferences like sugar free and gluten free. While most of our our items are organic, you can rest assured that none will contain concentrated sweeteners, artificial flavors, preservatives, or colorings. You will find that we can help you stay on budget and create a gift that is memorable and meaningful. Give the best artisanal and delicious foods that New Jersey has to offer, all the while supporting the Garden State’s hardworking, entrepreneurial small businesses. Just Jersey is dedicated to sustainable, environmentally practices. Our boxes are 100% recycled, our packaging fill (tree shavings) is compostable, and our local products are responsibly produced.